The Nike Zoom Pegasus Turbo had the “comfiest cushioning set-up” they have ever worn, a reviewer stated. Many users agreed that the shoe is lightweight. A versatile shoe that performed well both as running gear and lifestyle wear, according to a buyer. Several praises were made regarding the shoe’s design and appearance. The ZoomX foam delivered a ride that was not overly bouncy, said a runner. Another user commended the ZoomX as it allowed for a maximum ground feel. The shoe was able to maintain a brand-new look even after 100 miles, a runner mentioned. One user claimed to feel less fatigue after starting to run in the shoe. Some users thought the Zoom Pegasus Turbo was expensive. Wearers who were after a shoe that looked and performed outstandingly were satisfied with the Nike Zoom Pegasus Turbo. The shoe was highly praised for its cushioning and durability, and many experienced an above-average ride with long-lasting comfort. Overall, the Zoom Pegasus Turbo met the expectations of users and had successfully proven fit to be part of the Pegasus series. Nike Zoom Pegasus Turbo - Does it really make you fly? The Nike Zoom Pegasus Turbo is actually a combination of some of the previous Nike running shoe models. It has elements from the Pegasus 35, the React and from the Vaporfly 4%. There has been a lot of hype around this shoe, as is often the case with the running shoes Nike launches. I was just really curious to find out if it could live up to that hype or not. Nike promises an 85% energy return, their highest yet, and therefore making it a fast shoe. It’s also a very light shoe, it only weighs 238 grams. This shoe is basically a somewhat cheaper version of the Vaporfly 4%, but without the carbon fiber plate. The Vaporfly 4% claimed to make you run 4% faster (which could bring down your marathon time by minutes). The New York Times has proven that the Vaporfly actually does make you 4% faster and that it isn’t only an empty marketing promise. Although the Nike Zoom Pegasus Turbo doesn’t make any such promises, it does use the same kind of foam as the Vaporfly 4% and it does promise a high energy return. The upper is made out of Flymesh with Flywire on either side of your foot to give it a more secure fit. The upper is made out of two layers, the see-through mesh layer (which feels a bit like plastic) and an inner mesh layer underneath which looks more like Flyknit. Even though the mesh looks very breathable, the shoe was a little hot. Apparently, the two layers of mesh together made the shoe a little less breathable. The shoe has a tight heel counter that keeps your heel in place and the collar extends upward and outwards to guide your achilles. I have a bit of a wide forefoot and a small heel and this sometimes becomes a problem, but I had no issues with the heel of this shoe since I was securely locked in. The Nike Zoom Pegasus Turbo has the same ZoomX foam which was used in the Vaporfly 4%. The initial feeling you get with the midsole is that it’s a very cushioned shoe. It’s a kind of marshmallowy feel where you sink into it a little bit. But while running in it you also have a surprising amount of ground feel. The outsole is made of rubber and foam which small lugs to give you some traction. And although the Nike Zoom Pegasus Turbo is a road shoe, it does hold up reasonably well on easy trails. It is also quite durable, after more than 50 miles in the shoe the outsole hardly shows any signs of wear. The shoes are very responsive and have a good energy return, it feels like someone is slightly pushing you forward the entire time you’re running. It does feel a little bit like you’re flying. It is, therefore, a good 5k or 10k running shoe (I actually ran my new 10k PB in them), but the amount of ground feel makes it a bit difficult to run longer distances in them. Especially when you’re a heel striker and not a super fast runner (this is probably less of an issue if you’re a 2-hour forefoot striking marathon runner). I found a 10 miler to still be reasonably comfortable in the shoe, but the ground feel did start to bother me towards the end of the run. Even though the midsole feels like a marshmallow, that marshmallow flattens quickly when you land on it, so you can still clearly feel the road beneath your feet. I also wonder how long the marshmallow feel will last in this shoe (although so far I haven’t had any issues yet). This combined with the lack of support on the inside of the shoe makes that I would not use this shoe to run a marathon in. The shoe has a wide enough toe box to give your toes enough room to play. And the mesh fabric is flexible enough to give you enough room where you need it. The Nike Zoom Pegasus Turbo just isn’t very high in the front, which might be an issue for some. I had half a size bigger than my normal size and that gave me just about enough space in the front. Could have probably gone a full size up. The Nike Zoom Pegasus Turbo comes in several color options. I had the clearly recognizable seafoam green/grey with hot pink ones, although to me it looked more like neon orange. Seafoam green with hot pink would not be the colors I would have personally picked when buying a running shoe, but it actually kind of works. The shoe also has a very recognizable stripe running from the tongue down the front of the shoe to the outsole. It makes the shoe look fast. The Nike Zoom Pegasus Turbo is a fast shoe and you do feel a bit like you’re flying down the road. It is a good 5 or 10-kilometer racing shoe and it is also still comfortable for slightly longer training runs. But the medial instability and the ground feel prohibit it from being a great marathon shoe. Yes, the Nike Zoom Pegasus Turbo is very comfortable and a good road shoe, but will not protect you enough during hours and hours of pounding on the roads. I almost immediately fell in love with these shoes, or perhaps I was an easy victim of Nike’s amazing marketing. 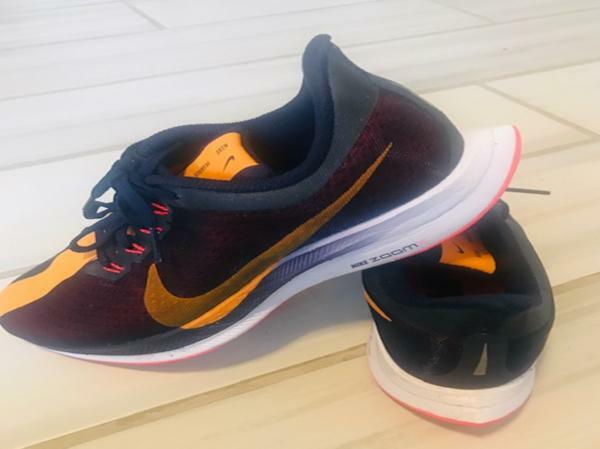 I last ran on Nike shoes only a few hundred kilometers a couple of years ago, and I have never been a fan of Nike because, generally, I don’t believe they are a great fit for my wide feet. I was in a Nike store for buying running socks and a hat, but I went away with a pair of Nike Pegasus Turbo too. I loved it as soon as I saw how light this model is. This is the light/race version of Pegasus. So, compared with the parent model, these trainers are much lighter and more suitable for faster sessions or race day. I think that if you train with Nikes, Nike Pegasus Turbo is a perfect choice for race day, especially for distances above 5k. I really like the heel pad. Some models tend to have a cumbersome heel pad, which promotes a heel strike. With Pegasus Turbo, this doesn’t happen. This shoe will help you run with your natural type of strike, regardless of whether you have a heel, mid-foot, or forefoot strike. The transition is very smooth, and the cushioning is just enough. The design is great. I prefer the version with the red stripe, but I could only find the blue stripe version in my size. I think there is no argument in saying that these trainers are among the best designs in the market. There is nothing I dislike about the design; everything is very cool. They are true to size, but if you have big toes, you may have some issues. In the shop, I managed to run a minute in the shoes before my big toe started rubbing with the stripe. I thought that it was just a matter of giving it time and running some miles in them. However, even after dozens of miles, I still had that problem with my toe. So, the Nike Pegasus Turbo is not a good model for my feet, especially for long distances. You can not run hours at a steady effort, with discomfort like that. That is one of the reasons why I didn’t switch to Nike Pegasus Turbo for race day. Nike Pegasus Turbo is a must for those runners who do daily runs on Pegasus and for those who are generally neutral Nike runners. They are suitable for fast workouts and race day, especially for longer distances from 5k up to marathons. One note of warning, most neutral Nike models, especially the lightest ones, amplify gait problems. I have very mild pronation, and this is more pronounced on my right side compared to what it is when I am wearing most neutral shoes. For that reason and lack of room for my big toe, I decided not to wear these shoes on race day. If you don’t have the issues above, go for them. They are great trainers, but you must have the gait for them. While, for that concern, the surface track and road are fine, while I wouldn’t use them for trails, especially in the winter. They are one of the lightest shoes for road running available on the market. For example, UK 7 (EU 41) is only 209g. I didn’t log a lot of miles on these shoes, but the overall quality seems to be one of the best, considering the market. I have seen shoes that sell at a similar price but are much lower quality. The outsole and upper sole seem very durable, and I estimate its life to last 400 miles. Considering the weight and the purpose of the shoe, that’s a lot. Compared to the Pegasus, the Nike Pegasus Turbo are much lighter and more suitable for race day. As such, rotating between Pegasus and Pegasus Turbo would be a smart choice. Both shoes have the same kind of fit. 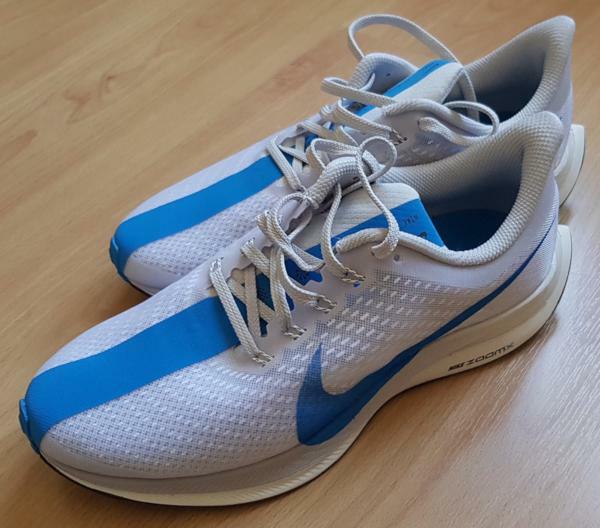 When compared with Zoom Fly, people typically consider Zoom Fly to be more suitable for race day. However, Pegasus Turbo has nothing less (it’s a 50/50). It is really up to the athlete which shoe to wear for race day. Compared with Vaporfly 4%, Pegasus Turbo shares ZoomXfoam with Vaporfly 4%, but without the carbon plate. If you cannot find or afford Vaporfly, Pegasus Turbo is a very good option. In recent years, Nike has invested a lot of effort in improving their offer regarding their running shoes becoming one of the best brands. Pegasus Turbo is a perfect choice for runners who already train on neutral Nikes. However, the comfort is not the best, the captivating design is at the expense of comfort, and the stripe doesn’t give enough room for the big toe. Also, as in the case with other light neutral running shoes from Nike, the Nike Pegasus Turbo tends to amplify defects in the gait, especially if you have a mild pronation. My verdict is that it is a must-have shoe but only if you already run on Nikes, or your gait is perfect, and you don’t have wide feet. Fascinated by the epic 4% magical shoe, I made the jump and bought Nike’s newest and closest model the Nike Zoom Pegasus Turbo. Priced at $180 and the selling point was that it features the Nike Zoom X foam cushioning used in their VaporFly 4%. While I was excited about new shoes, I wanted to see how they would compare to handling long distance and was hoping they could last 300-400 miles for that price. Plus the big question can they last for that price tag? A brief background on my Nike experience includes Nike Zoom Streaks, Nike Zoom Fly, and Nike Epic React Flyknit. So I already had high expectations before I hit the ship button. Upon arrival, I already knew what I was going to put this shoe though. They arrived on Tuesday the week before my two back to back marathons. They were flexible, light and colorful. However, the way they mold a foot is important to me. I have been fortunate to have zero black toes and still have somewhat presentable feet. Most of my running shoes I wear a size 8 or 8.5. So I ordered an 8. They are a bit wide around the forefoot. My upper foot moves. Yes, when I am running, I always analyze my form, my foot, my drop, and the way my body feels. They fit the heel perfectly and the material molded quickly to my heel area. I did one shake out run with them for about 5 miles and packed them for my marathon. After 55 extra miles, two courses, two temperatures, and two different paces, I am comfortable rating the shoe at 4.5 stars. The first course was hilly, and a lot of steady climbing. It was also a paved run with temperatures at 45/55 but high humidity and drizzle. I mention this because in my experience a shoe can change in temperatures and also can have different benefits or failures in a course. The shoe has waffle-pattern outsole which quoted by Nike provides a multi-surface grip when you push off the ground. I believe it does. With a slickness to the road mixed with drizzle and humid conditions, I felt the shoe provided good traction. Even at water stops where it can get slick at times, I felt excellent traction. Yes, I have worn shoes which I have almost slipped at water stations! I wore light socks by Features and had no issues with my foot and movement. When I felt exhausted from climbing, the shoe provided a bounce and a slight forward push off to keep me from getting tired. The first course was close to 1,000 feet in overall elevation gain. I believe these are excellent for speed workouts, tempo runs, and long distance. The first marathon was a practice tempo run for me since I know going into a second one was going to be much slower. It was colder, and I wore thicker socks. I would avoid this because they rubbed a lot with the extra movement in the forefoot. On Mile 23, I developed a small blister between the big toe and second toe. It was small enough I was able to pop it during the run and continue with little discomfort. The second marathon had very little humidity, and the pavement was dry. I would wear these shoes again. I will keep them as a trainer. I will not wear them in a marathon again because I have my favorites. I will, however, use them for easy runs ranging from 8-10 miles, perhaps a fast half marathon. Nike offered to exchange them for a size down; however, I do not think that will change the slight movement in the forefoot. They are light, they will and do help with your form. I have worn so many shoes that I know shoes can change a drop, a form, and can cause you a race or create pain. For the price tag, I am not 100% sold, but do not regret the purchase, and they do look amazing, and you can wear out of the box! I wore them for a few more miles after the marathon, and after 75 miles the thread of the sole still is maintaining. Good signs! Nike Zoom Pegasus Turbo - High mileage rental bowling shoe? 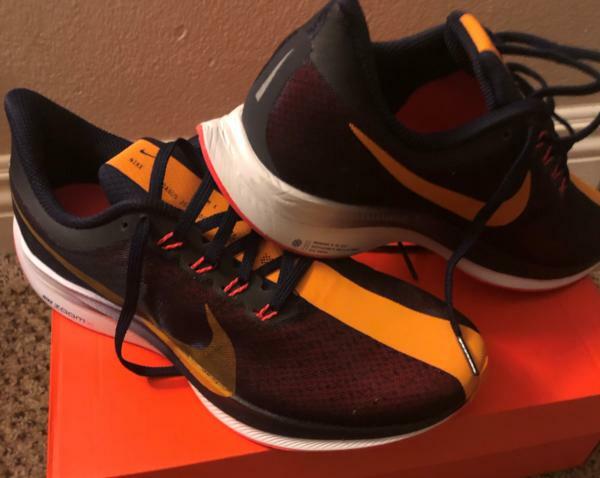 I got the Nike Pegasus Turbo because as someone with a lot of running injuries in my past, I am always looking for some cushioning. When I saw the hype train that these are very springy shoes, with ZoomX and React foam, I had to try it out. The box that they came in was nothing special, just the standard orange Nike box, but I was very pleased when I opened the box up. The colors online did not do justice to the vibrant colors that I saw when I opened it! The shoe itself looked like the Vaporfly 4% and the Pegasus 35 got together and had a child that liked to compete in bowling, despite being an elite runner. The stripe down the upper of the shoe carries into the outsole on the front of the shoes. I actually really liked that it was reminiscent of a bowling shoe since I think it gave the shoe some personality, as opposed to a lot of other running shoes that aren’t exciting to look at. I was a little confused as to why the tongue was so long. I am not sure why Nike made this design choice since it didn’t seem to add to the performance of the shoe, and the aesthetic of it seemed a little odd to me. Not too distracting, but just odd. Overall, I think it’s a good-looking shoe, but how does it perform? I have put about 20 miles into this shoe and so far, I don’t think that my impressions of the shoe have changed much since the first run. But I did get to know the shoe a little bit better after I put some miles on it. The shoe was very comfortable from the first time I laced it up. The shoe hugs your foot along the top with the Flywire lacing that allows a tight lockdown on the foot. I am a big fan whenever Nike uses this since the way that Nike shoes tend to fit requires me to go a half size up. The lacing system allows for the shoe to still feel snug along the top of the foot but allows some room in the toe box. The toe box looks really narrow, but I still found that I was able to splay my toes within the shoe. The collar of the shoe is nicely padded, and the ankle tab is kind of funky looking since it flares out, but I still didn’t feel like there was slippage of the shoe because of it. The flare out was actually kind of nice as it makes it easier to put on. Full disclosure, my review may be different than others that you have read since I am a mid-foot striker and a heel striker might feel differently about the shoe. With that out of the way, I should say that this is a noticeably cushy ride. From the moment your foot touches down, I felt the compression of the cushy foam underfoot. As I pushed forward, I felt that the shoe pushed me forward, with a rocker motion. Not quite like a heavily padded Hoka shoe, but I still noticed it a bit. One thing that I was a little disappointed in was that I didn’t necessarily feel the energy return that I felt in the Vaporfly or even the Pegasus 35. It wasn’t a springy ride, but I definitely felt the shock absorption in the shoe. The Nike Air Zoom Pegasus is known for being one of, if not the, most reliable running shoe from the brand. The excellence of the shoe is taken one step further, in the form of the Nike Zoom Pegasus Turbo. As the name implies, this Zoom Pegasus Turbo is meant to deliver the ultimate speed and a solid fit and feel, making it perfect for speed sessions and race days. The upper presents a translucent material that gives the runner a lightweight feel. This unique design makes the shoe look like it is moving even when the wearer is standing still. The main attraction of the Zoom Pegasus Turbo is the midsole, where it uses the ZoomX foam. First introduced in the Nike Zoom Vaporfly 4%, this material offers a fantastic level of energy return, as well as a heightened responsiveness with each stride. The sole unit is completed by a rubber outsole that helps in achieving smooth landings and transitions. Runners are recommended to purchase the Nike Zoom Pegasus Turbo in their usual sizing preference, as the shoe runs true-to-size. Although the shoe follows an anatomical shape, the silhouette is quite different, as it has a beveled heel for maintaining a good running position and long-lasting comfort. The Nike Zoom Pegasus Turbo is available in medium width for both the men’s and women’s versions. The outsole of the Nike Zoom Pegasus Turbo features an unusual shape: It starts as conventional in the forefoot, then it tapers towards the rearfoot for a pointed edge at the heel. This design secures the foot, therefore allowing it to move correctly in a biomechanical sense. The outsole tread is made up of pentagon-shaped nubs across the length of the shoe. The high-wear areas are formed from carbon rubber, in which the geometric pattern endorses durability. Meanwhile, the remaining portion is made from React foam. While similarly durable as the carbon rubber, the React foam has an additional purpose of stabilizing the ZoomX in the midsole. Featuring the ZoomX foam in the midsole, the Zoom Pegasus Turbo provides the lightest and most responsive ride, which is ideal for runners who are after speed and comfortable agility. ZoomX gives the wearer a fast and bouncy sensation that is long-lasting and consistent. The unique composition of the ZoomX allows it to be softer in the heel area to ensure a protected and well-cushioned ride, but not at the expense of bounciness. The highly-compressible nature of the ZoomX foam reacts according to the weight applied to it, and it responds promptly to produce a forward propulsion. Because this technology is created from Pebax®, it has a low density, is flexible, and has high impact resistance. The translucent mesh upper of the Nike Zoom Pegasus Turbo aims for an increased amount of airflow for improved breathability. As it keeps the foot cool, the translucent mesh also provides a seamless fit that reduces the risk of skin irritation. Flywire cables are found on both sides of the upper, which are a set of strong wires to wrap the midfoot and arch in a snug and adjustable support. The Flywire cables help connect the laces to the midsole for a guaranteed locked-down fit. Because of the narrow heel area, the heel counter has a thin structure. It permits the foot to stay centered and balanced over the midsole foam. The low-cut collar has a curved shape, as it aims to prevent rubbing and chafing in the Achilles area.